[prMac.com] Rochester, New York - Today, Static Z Software is excited to announce the release and immediate availability of Sound Control 2 for the Mac. With this release Sound Control builds on its already great feature set. Sound Control 2 adds per-app EQ enabling more tweaking than ever before. In addition, Sound Control 2 also adds customizable audio routing. Now users can reroute audio from their apps to any audio device. Sound Control enables users to easily and quickly change app volumes as well as selectively apply a EQ to their app's audio. 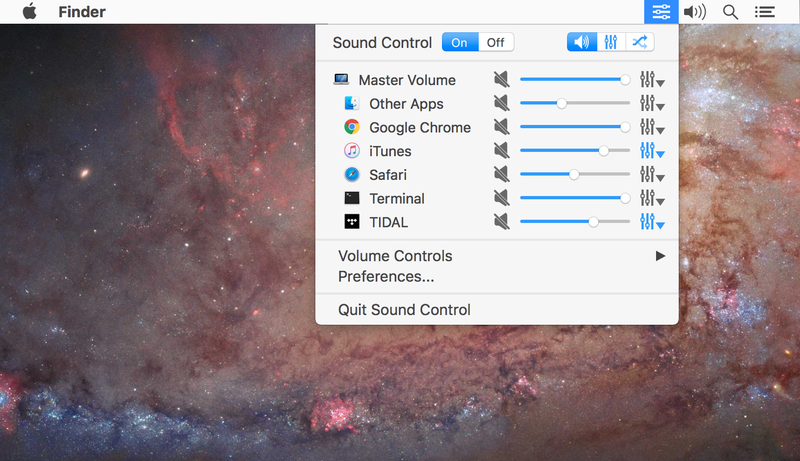 Sound Control does this by adding a software mixer to the menu bar of your Mac. In addition to the volume mixer, Sound Control also adds a software EQ to your audio output allowing users to easily tailor the sound of their Mac's audio to their specific taste or to properly calibrate to the frequency response of their speakers. A demo of Sound Control is available and costs $10 (USD). The demo can be found at Static Z Software online. Located in Rochester, New York, Static Z Software is a software company specializing in Mac and iOS software. With over a decade of experience developing award winning Mac software, Static Z Software strives to create new software that is useful as well as enjoyable. Copyright (C) 2017 Static Z Software. All Rights Reserved. Apple, the Apple logo and Mac OS X are trademarks of Apple Inc. in the U.S. and/or other countries.